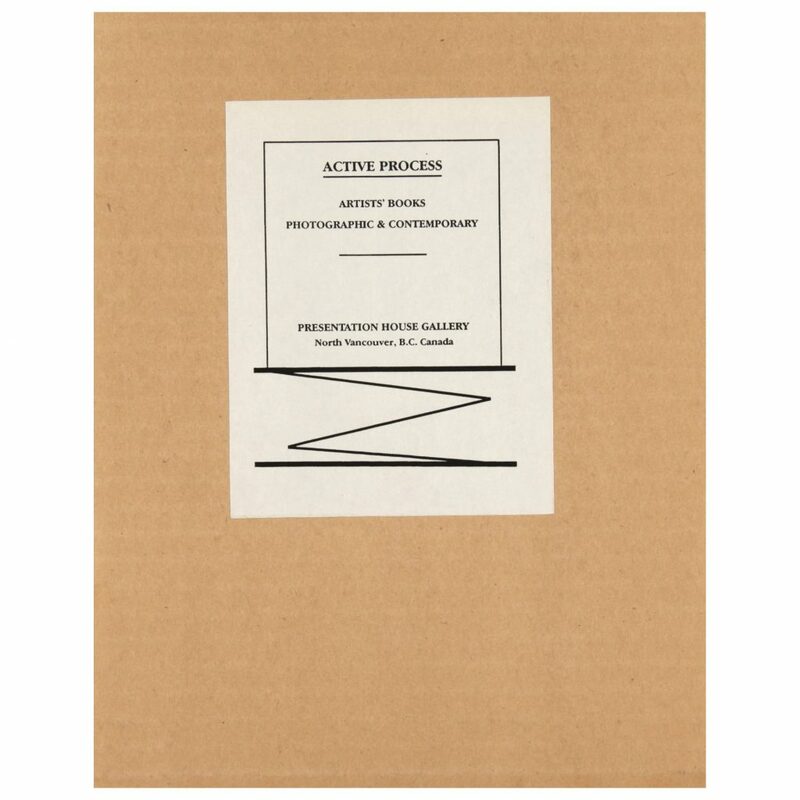 Active Process brings together a diverse selection of books and related material examining thematic concerns and developments in the production and use of artists' books and photography. The works, which have been drawn from the past eight years include one-of-a-kind, short-run, and large-run edition multiples, produced by 28 Canadian and Americain artists. Bookworks by Keith Smith, Barbara Rosenthal, Raymond April/Charles Guilbert, Susan kae Grant, Marian Penner Bancroft, Martin Lessard, Janice Gurney, Jamelie Hassan, Donna Leisen, Anne Ramsden, Nicole Jolicoeur, Susan Schelle, Liz Magor, Paul Berger, Robert Heinecken, Sarah Charlesworth, Eldon Garnet, John. S. Weber, Don Corman, Addison Thompson. Paul Rutkovsky, Carole Condé and Karl Beveridge, Judith Lerner Crawley, Jane Northey, Brad Brace and Michael Christopher Lawlor. Supported by the Canada Council, Emily Carr College of Art & Design, Duthie Books Ltd., and Booktique in Vancouver. The exhibition publication is available from the Gallery Bookstore. With Erich Ranfft, Jane Northey Keith Smith, and Cheryl Simon at Emily Carr College of Art & Design, Vancouver. 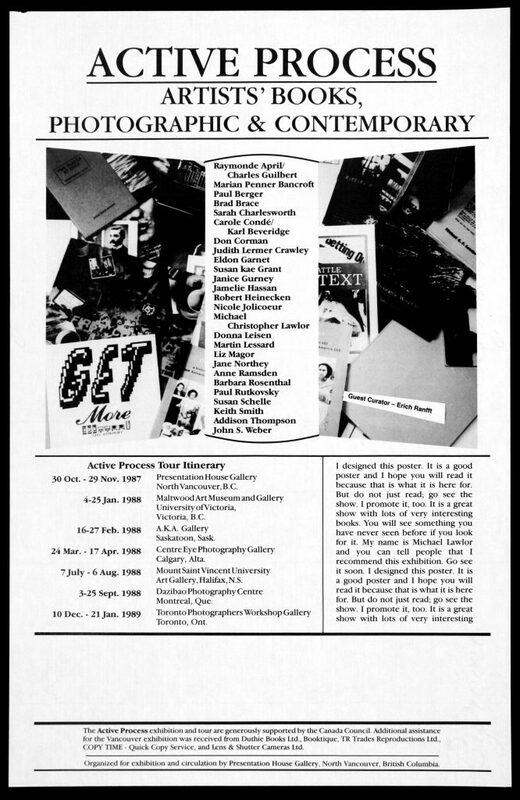 Active Process: Artist's Books Photographic and Contemporary was published in conjunction with a 1987 exhibition, guest curated and with an essay by Eric Ranff. The exhibition toured throughout Canada in 1988 and 1989. Featuring 28 Canadian and American artists: Keith Smith, Barbara Rosenthal, Raymond April/Charles Guilbert, Susan kae Grant, Marian Penner Bancroft, Martin Lessard, Janice Gurney, Jamelie Hassan, Donna Leisen, Anne Ramsden, Nicole Jolicoeur, Susan Schelle, Liz Magor, Paul Berger, Robert Heinecken, Sarah Charlesworth, Eldon Garnet, John. S. Weber, Don Corman, Addison Thompson. Paul Rutkovsky, Carole Conde/Karl Beveridge, Judith Lerner Crawley, Jane Northey, Brad Brace and Michael Christopher Lawlor.